Yumm! It’s like vichyssoise without pureeing or potatoes. Looks delish! I tried this this evening with pork chops and mashed potatoes. Very nice indeed, but I wonder how big your leeks are – I was only cooking for myself and ‘1 leek’ provided only a large portion for myself. I just cut the last inch off each end and add 1/2 cup cream for each leek. Just a hint of nutmeg(1/4 pinch) or a splash of port or sherry works well. I also julienne into 4 to 6 inch long strips. Looks great! I’m gonna cook this dish tonight, hope my girlfriend will like it. Thanks for the recipe! These things look gorgeous and I am sure are delicious. I’m bookmarking these to try this weekend. Mmmm! 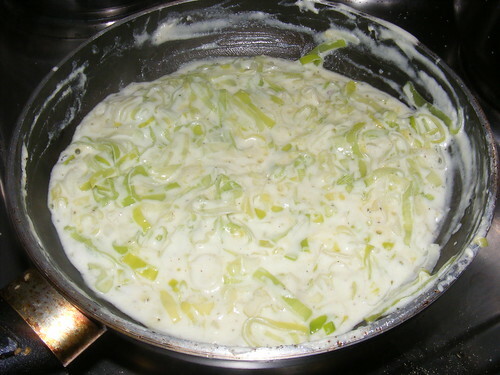 I love creamed leeks! So much so, I’d be doing more than 1 leek for 3-4 people, once cooked down thats probably only about a tablespoon per person. Of course you can eat the green bits of leeks! I cook the leeks for much longer than 3 minutes. Better to let them sweat gently in the butter on the lowest setting until soft, they will release their tasty juices. I agree that at least one leek per person is required for a decent-sized serving, as it’s so delicious people will want more. I too add nutmeg, and sometimes a little paprika. Some fish need scaling, and some need to have the skin removed before cooking. or oil the basket as you would the grate prior to grilling. I’m quite pleased with the infmioatron in this one. TY!